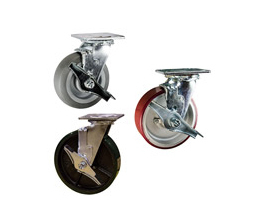 Service Caster offers a huge selection of casters with brakes. Depending on caster model, there are side lock brakes, top lock brakes, and posi-lock brakes available as standard or optional features. 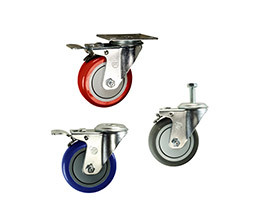 Total Lock casters are an excellent choice for braking the wheel and locking the swivel simultaneously. Our most commonly added brake style for light and heavy duty industrial models. When the brake pedal on the side of the caster is pressed, a plate engages the face of caster wheel tread, restricting wheel rotation. This differs from a side lock brake wheel which uses pressure from the fork assembly to prohibit free turning of the wheel. 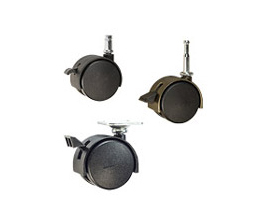 Position locks, also referred to as swivel locks, require the caster to have a swivel. Normally, the upper raceway of the swivel has notches allowing for a pin to be inserted. 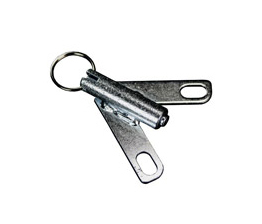 This pin when inserted allows the swivel caster to then function as if rigid. 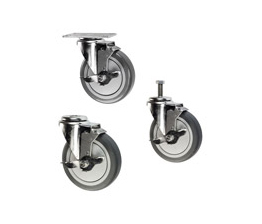 This locking mechanism is desired to allow for straight rolling in a desired direction. The norm is a 4-position lock, although other combinations are available.